Dominant – D Personality make it happen! 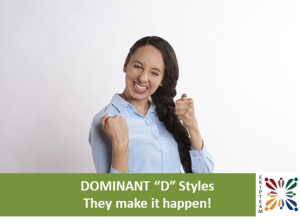 High “D” personality styles are often misunderstood … so this article is presented to help you to understand the D style better and hopefully clear up some common misconceptions you may have of this powerful personality style. 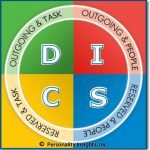 The DISC Model of Human Behavior presents four main personality styles, and the “D” style is one of them, of course. The Dominant – D style is outgoing and task-oriented. Outgoing means they operate on taking action. Task-oriented means that they are highly focused on getting things done. We use words like Dominant, Direct, Demanding, Decisive, Determined and Doer to describe this personality style. D’s can be intense. They tend to know 2 speeds in life – zero and full throttle… mostly full throttle. They communicate in a very direct manner, saying what they mean and meaning what they say. They decide quickly – almost effortlessly. They don’t mind conflict, because they would rather face things head on than tip-toe around any issue. They act boldly and with confidence. They would rather do something and take a risk versus doing nothing at all. They are results-oriented and are willing to overcome challenges as necessary to meet their goals. They like control and choices. They are comfortable being in charge and delegating. A common misconception about D’s is that they can be so task-oriented that they do not have much feeling on a personal level. It is actually quite the opposite. D’s are passionate. They can be tremendously loyal. While high D personality styles can be seen as being all about getting-it-done, it is important to remember that they also have feelings and personal needs that may not be apparent. If you earn their respect, they will “move heaven and earth” to help you. Those who work with a high D will do well to remember not to take everything that a D does or says personally – especially when a D is on-task. They are wired to achieve their goals, so it is good to realize that is the “mode” they operate in. You will be amazed at how much a D type person can relax after he or she is able to check off the task at hand. Until then, they are focused and determined. Even with an orientation toward tasks, realize that the D type can be very caring. The way they express their feelings is not typically by verbal communication. Instead, they tend to show they care by doing something for others – often behind the scenes. Here is an important tip for interacting with a D style: show the high D some respect, pick up the pace, and be part of the solution. Talk less and work more. Decide if there is a decision at hand. They are ready to go… now. So, the more you fit into that mode of operating, the more they will like it and the more they will respect you. Here is an important tip if you have high D traits… adapt to the pace of others (slow down if necessary) and communicate on a more personal level (show you care) in order to cultivate good relationships. Here is why: Building good relationships ultimately leads to more productivity and less fallout. D’s are a powerful group of people who are made to be world-changers with a vision. We need more of what they have, and we are better off with them in our lives. Reprinted with permission from the “Tip of the Week”. To subscribe for the free “Tip of the Week” please go to http://www.personalityinsights.com and receive Dr. Rohm’s weekly Tip every Monday morning.